How to wind Toroids without pain. All Toroids used in the RF-ToolKits are wound the same way...Clockwise! Here is an example of a Clockwise wound toroid. 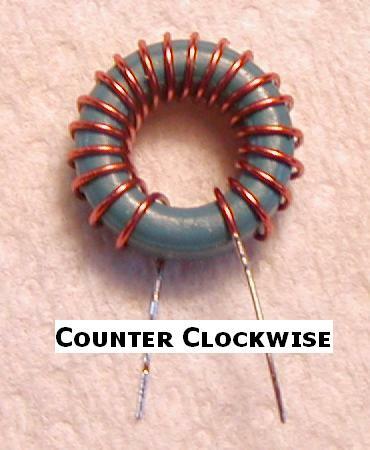 and this is an example of a Counter Clockwise wound toroid. Pre-cut the magnet wire to the required length. You can use this Toroid Calculator Program to help you determine the correct wire length. Note that every pass through the hole of the toroid is considered one (1) complete turn! 1. 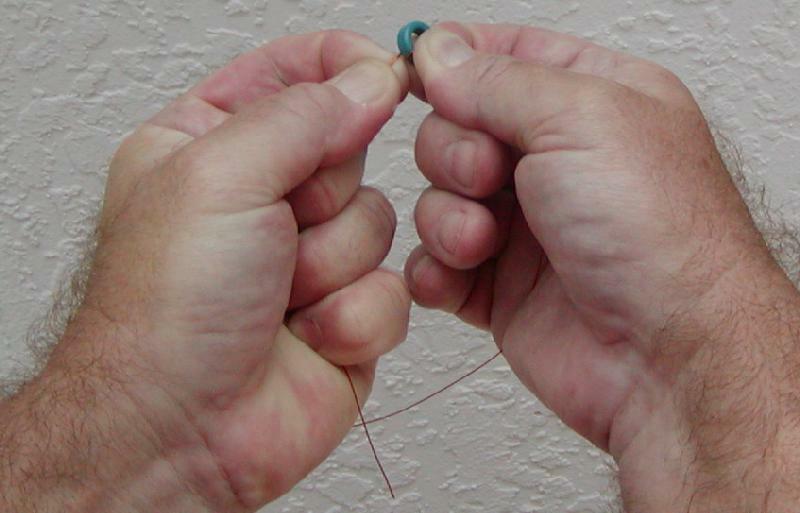 Hold the toroid in your left hand using your thumb and index finger so that half the toroid hole is exposed. With your right hand, insert half the wire length through the toroid hole. This is one (1) turn. 2. 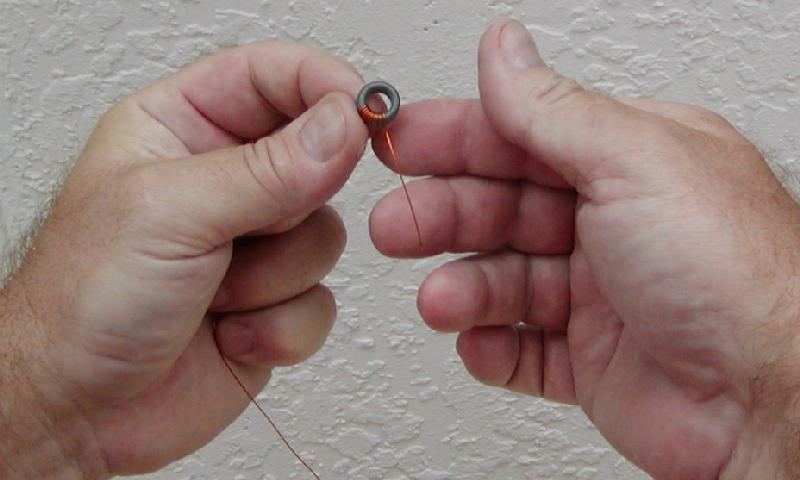 Now grab the toroid with your right hand thumb and index finger and pinch the wire between your thumb and the toroid body. 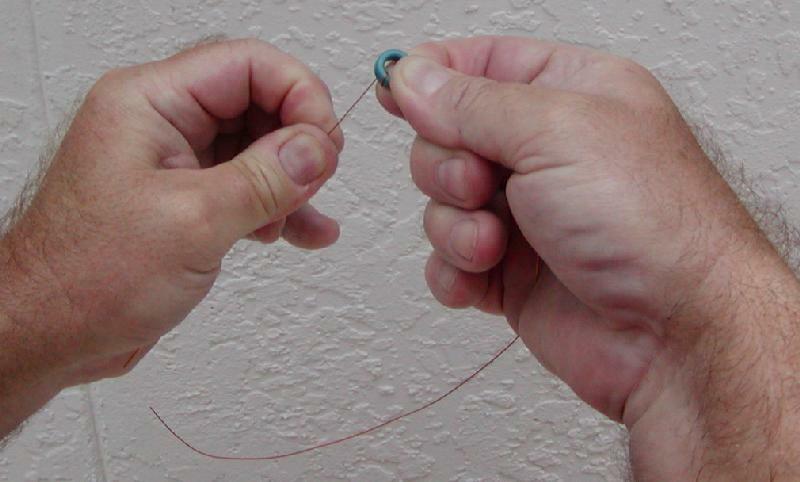 With your left hand, bring the wire around the toroid toward your left. 3. 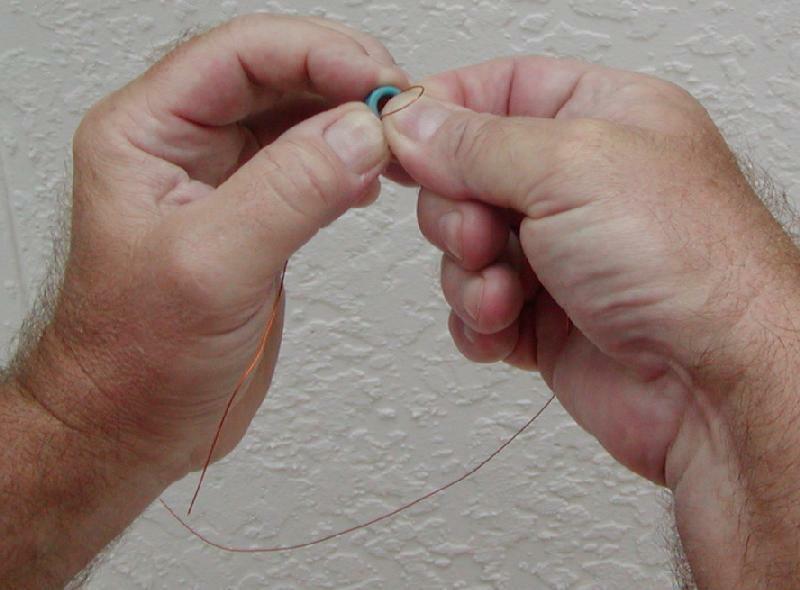 With your left hands thumb, push and form the wire against and around the toroid body. 4. 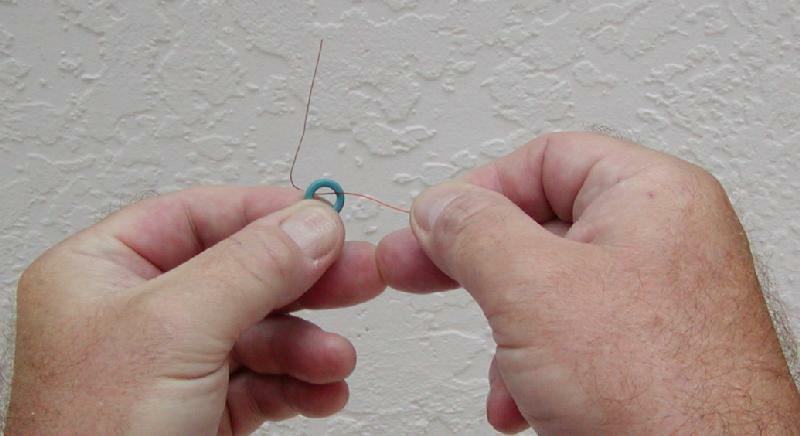 Now with your left hand, grab the wire end that is pointing toward you and insert the wire end into the center and push the wire through until a half (1/2) inch loop remains. 5. 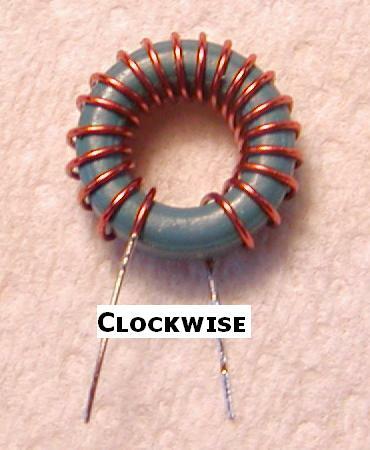 Push the wire loop against the body of the toroid. 6. Now pull the wire from the bottom of the hole towards you while also pushing from the top. Use caution. Do not allow the wire to scrape on the inside corners. 8. After you have half the wire wound on the toroid, turn the toroid over and repeat steps 2 thru 7 until finished. 9. 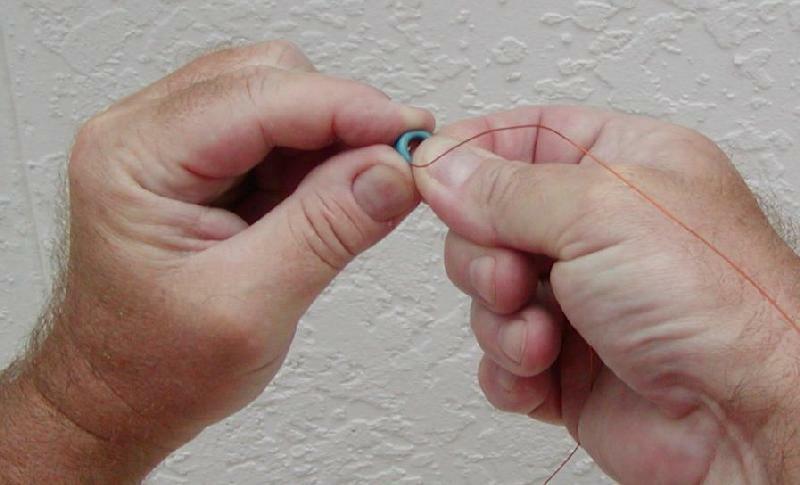 When winding the wire around the toroid body, wind it as tight as possible without spreading the wires. are calculated and measured with a 90 percent spread. This picture shows 20 turns thru the toroid. All toroids used in kitsandparts.com kits are designed to be wound Clockwise.